One year ago, I grounded my kids for bad behavior. We were at my cousin’s home and they began running around the house like wild hooligans! First, I was embarrassed. Then I found it disrespectful considering my cousins were doing me a favor by babysitting my 4 month old. Usually my kids are obedient and responsive when it comes to discipline, but this time, they threw care to the wind. When we got in the car (but before we headed home) I calmly and quietly turned around. Looking them in the eye, I explained to them that I expected more. “When we’re in someone else’s home, I expect you to be respectful, polite, obedient – just like we behave in our own home.” (In our family, we often speak about how good behavior has “benefits” while bad behavior has “consequences”.) So, I told them there would be a consequence for their actions. Like most kids, my kids LOVE TV. So while still in the car and thinking quickly on my feet (although admittingly coming up with a punishment QUICKLY is never a good idea), I said, “As your consequence, I’m going to take away TV time for a whole week.” As that came out of my mouth, I heard from the hooligans, “What? No, Mom!” and in my own head, the words came, “Woman, are you crazy? That will teach you to speak before you think. A week without TV? So now you’re on duty to entertain them. Yea…smart move, Mom!” Gulping, I stuck to my guns and said a little prayer. Long story short, we fared that first week much better than I anticipated. With no TV, there was actually less arguing about what to watch and whose turn it was to pick the show. That in and of itself was a huge blessing. Less for me to manage. I was also impressed that they actually LIKED playing together…A LOT! They began to use their imagination (from books we’d read) to create characters and plots, even the brown box in the living room became their “hide-out” and endless hours of play. After that glorious week of no TV – I gave them a reward: ANOTHER week of no TV! (Snicker, snicker). I was actually having fun watching them take leadership roles in their imagination play, learn to be flexible with each other and growing their relationship. And truth be told, I think they were some what excited to have an excuse not to turn on the tube: Mom’s new rule. Yup – the gift of parenthood: you get to make your own rules! Moral of the story: “Groundings” and “quick thinking” do have a long term advantage…for the whole family! About two weeks before Christmas, my husband and I were sitting watching TV. Up came a new commercial we’d not seen before. By the end of that commercial, I was fighting back the tears. Actually, I think we both were. Trying not too seem too “weepy” we tuned back to our TV show and went about our evening. The majority of my extended family flew off to a warm destination for Christmas. But with our young and busy family of five, we elected to stay in our cold, mid-western home-town for the Christmas holiday. We were eager to begin some new family traditions. We had nothing extravagant planned. No exciting events or big-ticket shows. But over those next two weeks, we made some great family memories. We took the kids on their first ferry ride across the Mississippi. As the ferry slowly made its way across the icy river, large flat sheets of ice splintered and cracked. The kids jumped out of the car, braved the bitter cold, and on tip-toe, leaned on the railing to listen to the boat pushing its way through the ice. And with the chilly winter air, came bald eagles by the dozens! 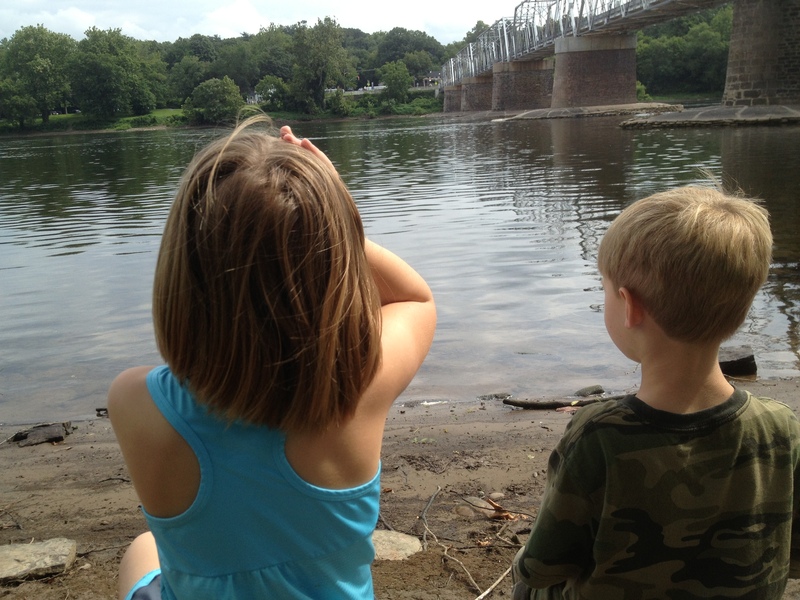 We had fun counting 1, 2, 3…up to 25 eagles that day! We ate at a family style restaurant. You would have thought we took them to Disney World. They had such fun passing all the dishes and feeling mature enough to “pass the dishes” all by themselves. We witnessed our son learning to skip for the first time. Not an earth-moving accomplishment – but to him it was, and we were there to celebrate with him! We played “chess” on a life-sized board. We took a drive through a wintry, wonderland. It was breath-taking. We, as a family (with no agenda or time-frame), were just together, experiencing the simple and yet profound joy and happiness that comes from just being. Together. It was, in the most innocent and sweet way, perfect. Little did I know, for the last two weeks he had been video taping our family memories so as to create this iMovie. After seeing that, my “Great Christmas” turned into the “Best Christmas of my whole life!” He captured perfectly the essence of love, of giving, of unselfish thought which permeated our holiday. It was the best present I could have asked for. And for that, I thank him! 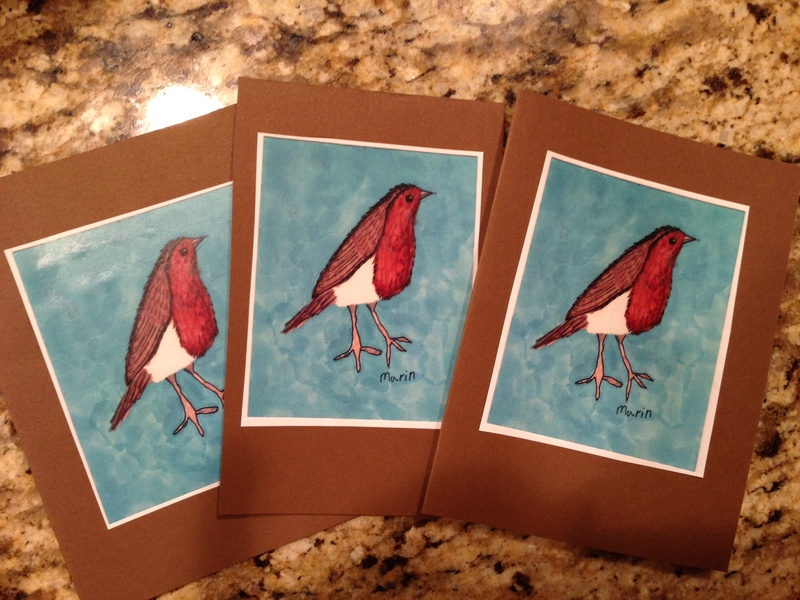 So the Craft Fair was a great success! 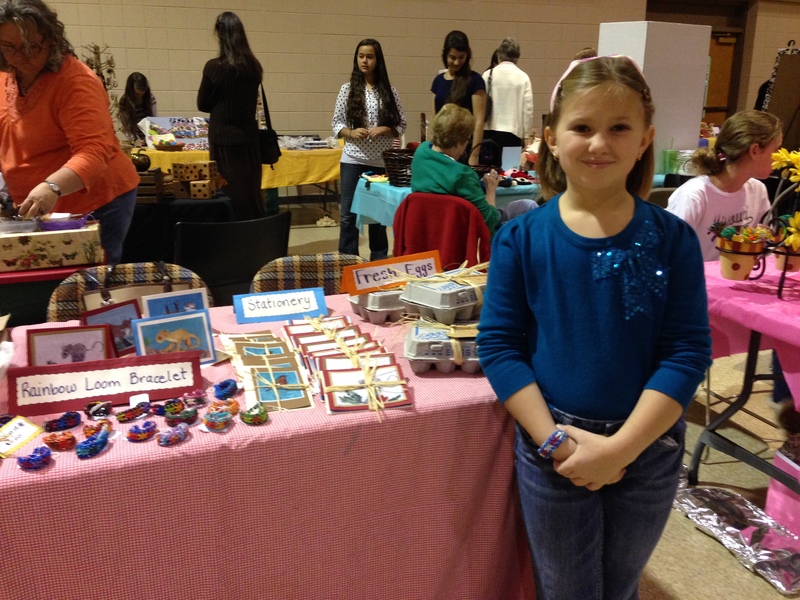 As we drove to the craft fair, I talked with my daughter about how we greet our customers (potential buyers). 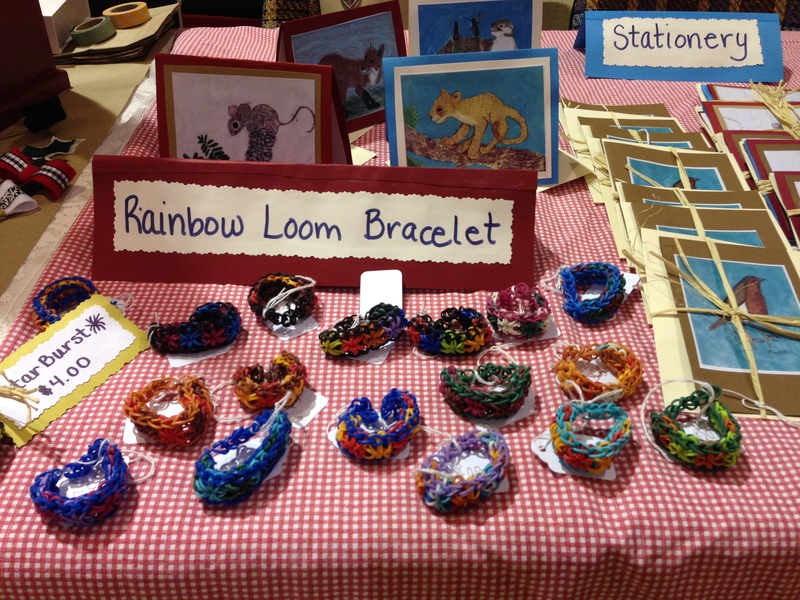 We look the customer in the eye, smile, and perhaps open a conversation with a question: “Are you looking for something particular today?” “How can I help you?” “Do you have any little girls in your life that would enjoy a rainbow loom bracelet?” And so on. After that quick discussion on handling your customer, we arrived at the craft fair. Focused (and yet trying to hide her excitement and act “grown-up” as though she’s done this all her life), my daughter pulled out her gingham table cloth and began setting up her inventory. I started to help her lay out her bracelets and stationery when I was sweetly told, “Mom, I can do this. Let me do it.” Happily, I retreated and allowed her the joy of “setting up shop!” Nothing can replace that feeling of independence and confidence, the joy of investing in something all your own, except when YOU are doing the work and doing it well. And naturally, this was the whole point! Long story short, after 4 hours she had sold quite a bit of her inventory. There was one hour left of the craft show, and many people were beginning to discount their items to clear out their inventory. I suggested to my daughter that she take her last few things, walk around to other booths and try to sell or trade them out. At first she was reluctant. She shook her head no. “Ok, that’s fine. It’s just more money you could have in your pocket but it’s totally your own choice.” (Ahhh the good ‘ole “take away”…a parental-strategy-must-have and a late “sales’ lesson for next year.) I could see the wheels turning and without a word or an expression, she picked up her last few bracelets and strode around the room trying to sell! A few minutes later, she had sold 3 more bracelets – at a discount – and added $6 more towards her bottom line. A fine lesson to end the day! All in all – she had made enough money to pay back her investor (her mom) the $75 she owed. And happily she walked away with $47 in her little, pink purse. Shoulders high, a confident gait, and her heavy purse on her arm (that $47 was all in 1’s) her lesson was complete! 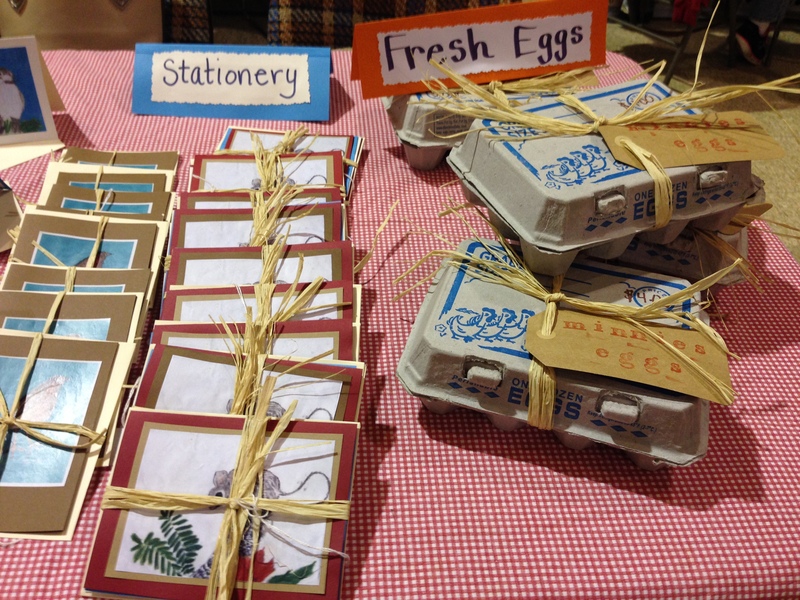 So this weekend, my daughter (2nd grade) will be a vendor in her first craft show. For 5 weeks she’s been making rainbow-loom bracelets, collecting eggs from our 30 chickens and crafting stationary from her art projects. In an effort to teach her the relationship between income and expenses, I sat her down this morning with receipts in hand. I wanted to show her what I had spent to get her ready for this show. “Hold on, hold on,” I quickly said. “Your expenses are just half the story. Let’s now talk about your potential profit – the money you will get once you sell your inventory. Road tripping with young children is no small feat. In addition to your clothes and other needed items, there’s the stroller, the pillows, the toys and books (we all want happy riders), the movies and music, the cooler full of snacks and drinks, charge cords for all our mobile devices, oh and of course, the kids! This last summer, when we set out on our exciting east coast road trip (Liberty Bell in PA, Washington Crossing the Delaware in NJ, Natural History Museum in NYC, etc), I had my itinerary all planned out. Each day was accounted for with either driving or sight seeing, and we were all excited! I was sure I had thought of everything. However, as we journeyed, I was happy to learn I had not thought of it all! I knew our trip would be educational, but I had no idea how many academic “fringe benefits” there’d be! A fantastic travel game for kids 5 and up! The 50 States: For starters, I had ordered the “Wee Sing America” CD (Pamela Conn Beall) from our library. In my americanly romantic mind, I thought it would be fun to listen to these patriotic songs as we traversed through the historical, revolutionary roads. 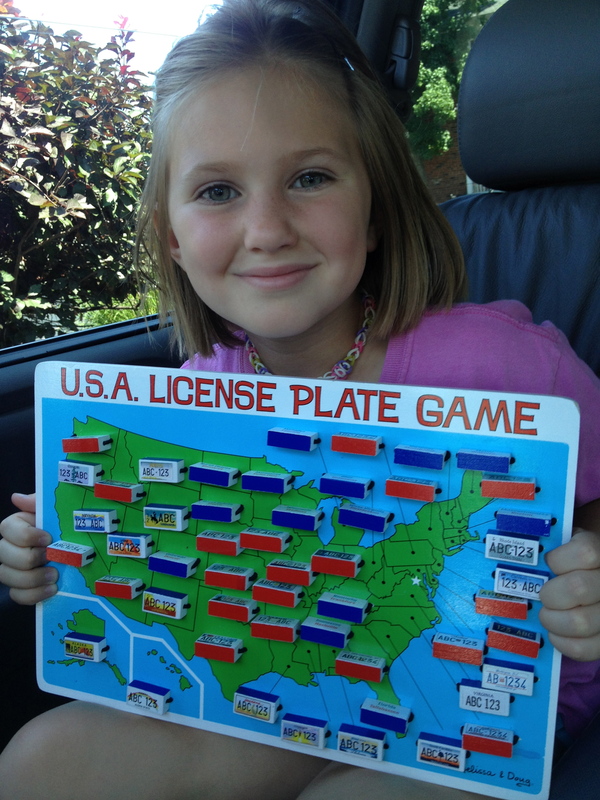 Additionally, as a fun gift for the kids, I purchased Melissa and Doug’s License Plate Game. The wonderfully thought out game added so much to our hours spent on the road. For each car or truck we passed during our 3000 mile trip, I had both my 7 and 5 year old reading the plates and exclaiming which state they had just seen. And as it turned out (which was totally unplanned) there was a “states song” on the CD which my son and daughter fell in love with. Because we were talking so much about the states with the license plate game, they naturally wanted to put these state names to song. So within a week, they had learned ALL the 50 states, in alphabetical order, with great joy! That was not part of my educational syllabus – but hey – I’ll take it! Elevator Etiquette: I don’t know about you, but I find “social etiquette” and children don’t naturally go together. There’s time and training that is needed to achieve a happy balance. So with each hotel we stayed at there were elevators which allowed us to practice the importance of elevator etiquette numerous times a day. In a short time, my children learned that when waiting for an elevator you stand back and wait to the riders to exit – rather than push on like elephants. Likewise, once you get on board, they had to take “happy” turns pushing the buttons or that privilege was taken away. Great motivation to do the right thing the first time! Hotel Room Numbers: What a great math lesson this was! Once we arrived on the floor where our room was each night, we began letting our kids take the key card and do the figuring out of where we’d be spending the night. We’d walk off the elevator and see the list of room numbers: 401-429 to the right and 430-450 to the left. We talked about odd and even numbers as well as greater than and less than. From the number on our key card, the kids figured out which direction our room was (odd or even = left or right) and then had to decide if we need to walk a far ways to our room or if it would be close to the elevator. It was real life math!! Organization: To make our mornings smooth, it was each child’s job to know the next day’s activity and to pull out the clothes they needed for that activity; whether it be a long car ride, a day at the Liberty Bell, a day in NYC or just a down day. They began to use their anticipation skills and pre-plan for their own needs in the future. Really – exercising that independence skill I strive to teach them daily. Additionally, this meant they needed to sort through and organize their car pack for whatever items they wanted close to them during the car ride. They needed to grab their books, music, toys, etc that they thought they’d use the next day. Again, thinking ahead and becoming self-sufficient. NO Instant Gratification: Good or bad, instant Gratification doesn’t exist on road trips. Instead, car rides help children understand that not everything happens within a couple hours – like a plane ride. They learn how much distance exists between states and destinations. And with that stretch of highway comes time. A blessed thing! That opportunity of time allows kids to again exercise their muscle of patience and self-sufficientcy. They learn to entertain themselves. I loved the natural rhythm that evolved as we drove each day. The early excitement in the morning as we began our day, the slow settling into the drive and sinking into a good book, sticker project, coloring activity, or new toy, and then the shift into playing with one another. They learned to entertain themselves or each other with the simpliest of things. At the end of out trip – we drove from NJ to STL in one day – 17 beautiful hours! But after about 11 hours of driving, our 10 month old was tired and bored of his toys. “Enter knee highs!” I had some knee highs in a bag which my kids found. They got the idea to tie them together and then across the inside of the car (from hand rail to hand rail). They then strung toys on it so the baby could reach out and play with the toys. And happily it worked. Hey – it all comes down to the marketing, right? How ideas are presented. Change up the angle or the way the toys are played with and it’s a new toy. But that little discovery would not have come about if we were on the plane. Our east coast trip was one of our most favorite trips to date. We had so many happy, fun, inspiring, sweet family times that I’d do it again in a heartbeat if given the chance. In fact, we’re planning a “Westward-Ho” summer road trip for 2014! Stay-tuned! I bet there are more “fringe-benefits” when traveling with kids to be discovered! Have you traveled with kid-lets and what benefits have you found? This fall in homeschooling, we’ve been studying influential leaders in American History. Because we studied about George Washington and the Revolutionary War this summer, it seemed appropriate to then study the Civil War this fall. We’ve loved studying all about the Confederate and the Union soldiers, the role women played in caring for and supporting their troops, and the role children played during this time – helping out at home on the farm or becoming an integral part of the war as a drummer boy. We’ve dug deep into Abraham Lincoln and the great moral courage he expressed to help free the slaves and reconstitute the United States. We visited his Presidential Library and Museum in Springfield, IL. We’ve read dozens of children’s books about the joys and hardships this era produced on our people. Anyway, while my kids and I are no experts on this time period, we’ve developed a love and an appreciation for what our brothers and sisters did during that time. I can only speak for myself, but all romantic longings to live in a “simpler time” have been cured for me. I honestly don’t know how they did it back then…but I am sure grateful for their tenacity, courage, and bravery. But let me get to the point of my writing tonight…. An added bonus to our study arrived in the mail last week! I recently learned that a family member of mine has dug deep to learn more about our family history. In fact, she happened to have a first hand account of our family story as told by my great grandmother and lovingly sent us a copy of this incredible story. One morning during our home-schooling time, I sat my 7 year old daughter down on the couch with me. I explained that while we’ve been studying about the 1850s-1860s, I was going to share with her something very special. Through the words in her story, Ella Dodge Avery, my daughter’s great-great-great grand-mother, born in 1853, shares with us her story as if she were sitting on the couch right next to us. Still not quite believing, she continued, “My REAL family member? Like this is part of our family?” Laughing, I continued the story and she, riveted, was on the edge of her seat. At one point, my daughter jumped up off her chair and went dashing up stairs. I asked her where she was going to which she replied, “Hold on…” In a moment she brought back a presidential flip book I had purchased for her which explained who was president and when. She was hungry to learn who was president when Ella was a little girl. She learned it was Franklin Pierce. Then we did the math and then realized that Ella was about 8 years old when President Lincoln was elected. I could see the wheels spinning…”So Ella was about my age when President Lincoln was elected,” my daughter said slowly. “Yes, that’s right,” I replied. It was like she was touching history…REAL history. Not history from a book but her history. It was a powerful moment. I could see my daughter was now not just learning history, she was beginning to define her own character and take pride in the strength of her great-great grandmother. This is what educating is all about – making the learning real and impactful. This is REAL history, and we each have it. I’m curious, what have you discovered about your family history that has made an impact on you? It’s not everyday that you get to stand in a place, a specific spot, and know that your life is what it is today because of an event that happened here over 237 years ago. This summer my family got to do just that! 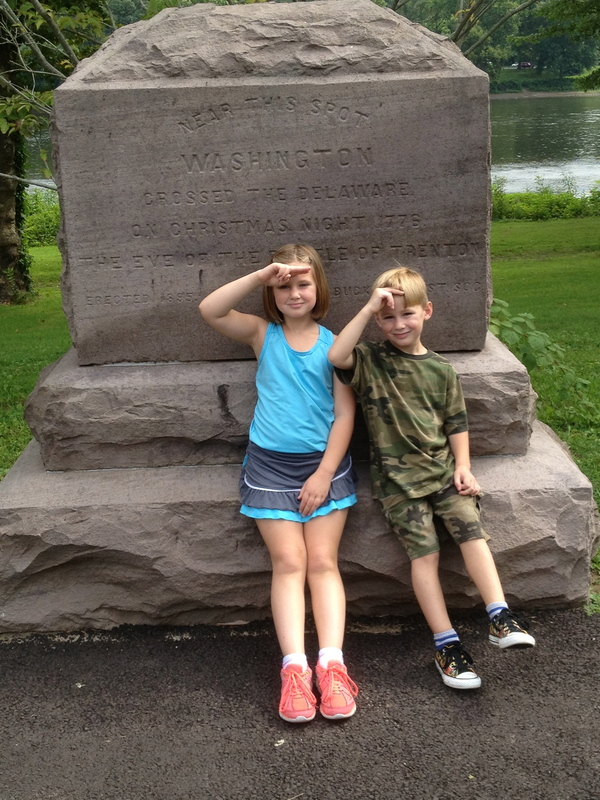 We had the awesome opportunity to visit Washington Crossing Historical Park in Washington Crossing, PA. Weeks before we drove up to the park, my 4 year old and my 7 year old and I researched and read (children’s) stories about General George Washington and his army. We knew that in the winter of 1776, the War for Independence was failing. General Washington and his army knew only defeat and discouragement. Early on in December of 1776, he and his men were forced to retreat across the Delaware River into PA. Cold, wet, many soldiers hardly clothed, and with very little food, this was not the likely sight of war heroes and flags waving. In fact, Washington saw his army shrinking daily due to desertions and enlistments expiring. How’s that for a happy Christmas? But on December 25th, after much deliberation and preparation, and truly most of the odds totally against him, Washington and his men began to cross the Delaware. “Ok,” you say, “I know that story. So he crossed, they fought, they won and the rest is history.” But no, that’s not it! That’s not the whole picture. This is the spot…RIGHT HERE…in 1776 on Christmas night at 6:00 PM (about the time you and I sit down to our Christmas dinner with family), when 2,400 troops began assembling for the crossing of the Delaware. The river was choked with ice. Flat, sharp jagged pieces flowing down river. A blinding snow storm blows in, sleet, wind. There are no Ugg boots for these men, no wool hats to protect their head and ears, no NorthFace water-proof down jackets, no. They are lucky to have their wet wool coats and thin leather boots. Maybe socks – but they’re wet, too. Dinner before a big fight? Probably not. Oh, and some men are not even wearing shoes. They are bare-foot. Feet are bleeding and yet they are still walking in the snow. In fact – not just walking. They are loading guns and cannons and cannons balls and horses on to heavy Durham boats. And these boats were not custom made for this fight…nope. These boats were usually used to carry pig iron down the Delaware River. The troops just grabbed what they could. So as I am standing by the Inn in this lush green grass, I see a small trail that leads down to the river. 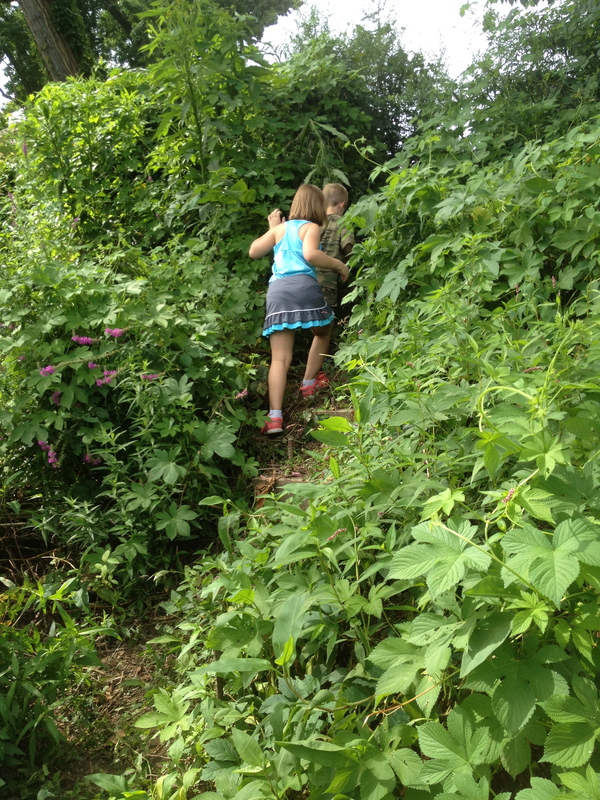 I grab my kids hands and we head down the path. “Where are we going, Mom?” my four year old asks. “On an adventure!” I reply. We sat there in silence. This was the place, this was the spot on the river, where history took a hard right turn. This bold move by General Washington changed the tide of the war in the American’s favor. It reignited the cause for freedom and rushed new life to the American Revolution. We are Americans, free and fortunate to be living in this great country. We THANK them for their ultimate sacrafice! And on that beautiful, peaceful day by the river, my family and I did just that!